Mickey Dougherty, FICF, CFFM is the General Agent for the Greater Baton Rouge area. In this role, he recruits, trains, and leads the agents in his territory, helping them properly fulfill the founding vision of the Order. Born in Freeport, Texas, Mickey grew up in Lake Jackson, Texas. 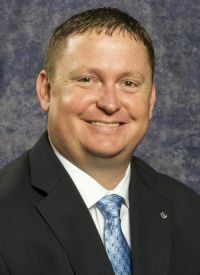 Mickey was a member of the Professional Golf Association for 10 years before becoming an insurance agent in 2007 with Bankers Life and Casualty. In 2009, Mickey joined the Knights of Columbus field force in the Lesak Agency serving the South Texas area of Brazoria County. Mickey was a Qualifying Member of the Million Dollar Round Table (MDRT), which is the premier association of financial professionals. Each year only one percent of the world’s financial service professionals qualify for MDRT membership, based on high levels of client service, ethical standards, educational achievements, and production requirements. Currently, Mickey services the Baton Rouge, La area with over 10,000 members and over 90 councils. Mickey knows that continuing education is important for all insurance agents. He has earned the designations of Fraternal Insurance Counselor (FIC) and Fraternal Insurance Counselor Fellow (FICF), as well as Certified Fraternal Field Manager (CFFM). He encourages the agents in his agency to maintain their high level of knowledge through their professional coursework. Starting January 1, 2013 Mickey accepted a promotion to the position of General Agent. This caused Mickey to relocate to Denham Springs with his wife, Sarah, and son Cameron. This family is also transferring from St. Michaels Parish in Lake Jackson to Immaculate Conception Parish in Denham Springs.